Irvine, Calif. – R.D. 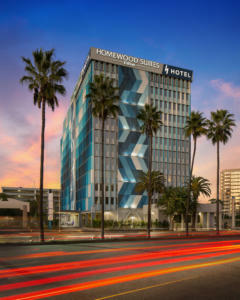 Olson Construction, an award-winning general contracting firm in California, today announced the completion of H Hotel, a 12 story, 260,000-square-foot project located adjacent to Los Angeles International Airport (LAX). The dual-brand hotel is comprised of Homewood Suites on floors two through six and Curio by Hilton on floors seven through twelve. Located at 6151 West Century Blvd, the adaptive reuse project was formerly an office building constructed in 1962. Amenities include separate fitness centers for each hotel brand, a pool, two meeting rooms, full-service restaurant, breakfast area and coffee bar. Catering to the hotel’s traveler demographic, there is also a transfer lounge on the eleventh floor with seating, showers, lockers and other amenities for those awaiting flights. A rooftop deck features picturesque views of the nearby airport runways and ocean. R.D. Olson project partners include Melzer Decker Ruder Architects, Saiful Bouquet Structural Engineers, Robison Engineering and Design Force Corporation. The project took approximately 17 months to complete.